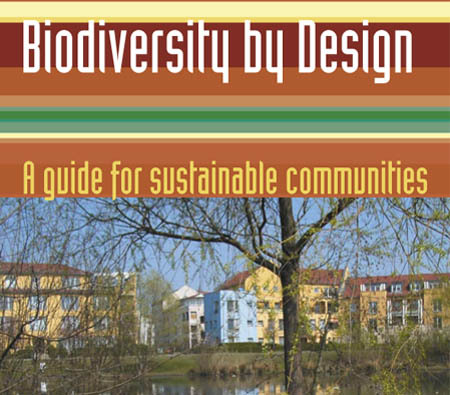 Biodiversity by Design is a TCPA Sustainable Communities guide. Published in hard copy in 2004, and on-line in 2005, It aims to provide guidance on how to maximise the opportunities for biodiversity in the planning and design of sustainable communities. It also seeks to highlight the wider social, economic and environmental benefits of biodiversity and green spaces in urban areas. It covers each stage of the design process, presenting a toolkit of best practice that can be tailored to different scales of opportunity. To do this it draws upon the lessons from over 20 international case studies, including a special set from Berlin. To illustrate the opportunities arising from the Sustainable Communities Plan it also includes completed and 'in-progress' UK case studies relevant to 'Growth' and 'Pathfinder' areas. The guide sets out the principles of 'biodiversity by design', before moving on to emphasise the importance of analysing a site and its context. It then explores each element of masterplanning and detailed design, before moving on to address the overarching issue of management and stewardship. It has been extremely well received by local and regional government planners, as well as by masterplanners and sustainability specialists. In some counties and districts it has been even has formed the basis for supplementary planning guidance. The guide was written by URBED, with input from Mike Oxford from the Association of Local Government Ecologists (ALGE), Neil Corteen, English Nature and TCPA. The 2004 publication was sponsored by English Nature, the Hyde Group and RSPB. In 2005 a special on-line version was developed by URBED and UHC with sponsorship from the Countryside Agency.